Arisaema Shikokianum in my garden. 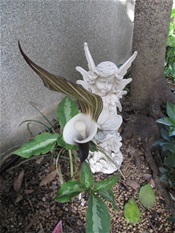 This unique plant is 'Arisaema Shikokianum' of which origin is Shikoku, Japan. They are one of plants of which extinction is worried. On March 27th, 2014, I noticed two were budding from the ground in my back yard. I bought two buds at the market last spring, planted there, but after autumn they had disappeared from the ground and I never remembered about them until the day. How nice it was to find them back there!! Fortunately they seem to like the environment of my garden and maybe I can save them from an extinction! This picture was taken on 31st March at its full blossom. Its Japanese name is Yuki-Mochi-So (雪餅草) which means Snow-Mochi(Japanese rice cake)-Plant. The white petal in the middle of the flower looks like a piece of real Mochi!